New Services for the Spiritual Community! 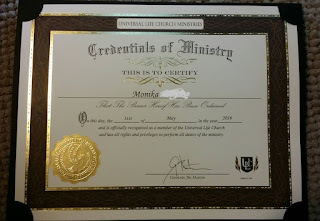 On May 31st, 2016, I received my Reverendship from the Universal Life Church. This provides credentials for services that I can now provide for the Mid-Atlantic & East Coast Communities. I am very excited to expand my spiritual leadership into this realm! I am able to legally join two consenting adults into marriage in Maryland, Virginia, Delaware, Washington D.C., and other locations within the United States. I will never discriminate against anyone because of their race, nationality, preferred gender, preferred partner, etc. Love shows itself in many forms, and the Soul recognizes what it wants, no matter the trappings of the physical body (i.e., LGBTIAQ+ inclusive). Back in January 2012, when I first started this blog and my professional shamanic practice, I asked my Spirits for a magical name. This name would symbolize my work, my personality, and help me retain some careful anonymity when working in public mental health. I remember how Coyote barked, "Lonely Coyote!" I recall how stunned I felt; how quickly the name came, and not really understanding what it meant. I liked the "flow" of it, and how it rolled off the tongue. And so I took the gift of my name, and spent the last four years learning its lessons, its benefits, and its restrictions. This year, the lessons have been heart-breakingly painful. I have separated from my ex-husband, separated from my former teacher, and separated from a few small-yet-damaging magical communities. The loneliness I felt was overwhelming, but stripping everything away helped me to hone my skills and focus fully on my healing work.